The Scythe necklace, Harvest amulet, Lammas amulet, asymmetric necklace, hammered brass, raw brass, geometric design, minimalist. The Scythe… Scythe necklace, Harvest amulet, Lammas amulet, asymmetric necklace, hammered brass, raw brass, geometric design, minimalist. The scythe has long been a symbol of the impermanence and cyclical nature of the universe... from life to death to rebirth... and also represents the forward movement through difficult times towards a desired goal and has been a symbol associated with Lammas, the first of the three Neopagan harvest festivals (followed by Mabon and then Samhain) . 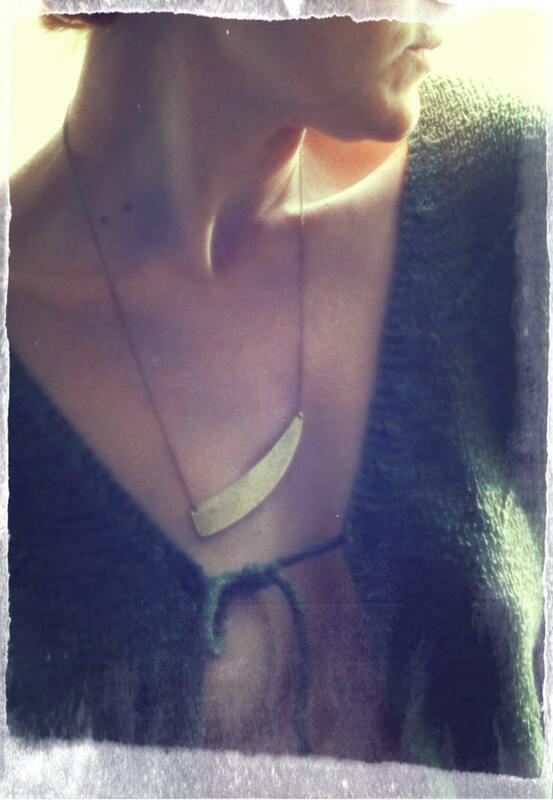 In this necklace I have taken the shape of the Scythe as inspiration and crafted an asymmetric hammered brass necklace that fuses ancient symbolism with modern, minimalist design. The necklace is 22 inches (56cm). Each Scythe necklace is made to order for each individual customer. Scythe… Miniature sterling silver Scythe charm necklace, Harvest amulet, Lammas amulet, asymmetric necklace, geometric design. Crescent moon earrings, hammered brass, flame oxidised, large crescent earrings, rainbow patina. 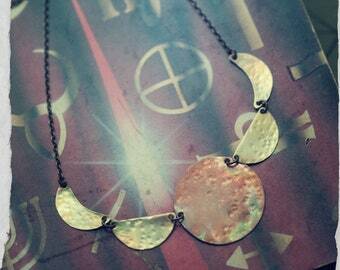 Hammered brass crescent moon necklace, seven moons, magick symbols, feminine energy, Goddess necklace. The necklace was even cooler in person! Thanks for the speedy shipping and beautiful product! 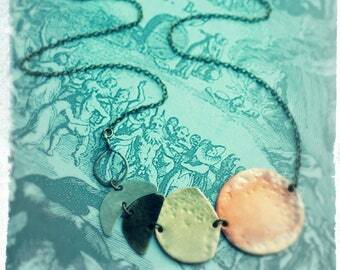 I love my new necklaces, I think I’ll be ordering a few x-mas gifts in the near future! Garnet and Emerald gemstone earrings with hammered and flame oxidised copper crescents and sterling silver ear wires. Copper feather earrings, fire oxidised, rainbow patina, hammered copper, free spirit symbol.